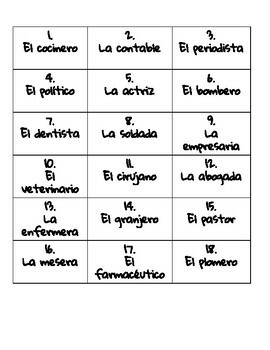 I use this activity in Spanish III. Students match up 3 parts of the sentence to make logical sense. Each part consists of a profession, a verb conjugated in the conditional, and the rest of the sentence. This activity gives students the opportunity to problem solve in order to put together a complete, logical sentence. The idea is to determine what content connects to a specific profession. 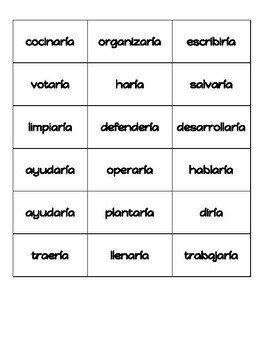 Though it does incorporate the conditional, all verbs are conjugated for the same subject so there is not a lot of variety of practice. 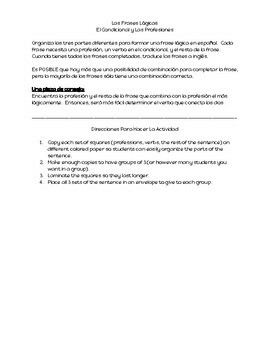 I usually make enough copies so that students can work in groups of 3 or 4. Once they get all the sentences put together (18), I usually have them translate to English, focusing on the proper translation of the conditional tense. 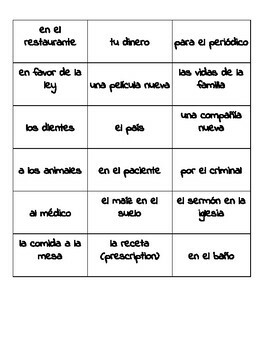 Instructions for how to put this activity together are provided, as well as instructions for students in Spanish.